Even if you aren’t going back to school this fall, I’ve spoken before about how autumn always brings about a sense of ‘change’ for many of us. Maybe someone in your life is starting a new experience, maybe you’re hunting for a new job, or maybe, like myself, you’re simply eyeing the cute fall fashions that are rolling into stores and feeling like it’s time to add to your wardrobe. To take another angle – why not try something different that simply makes you feel beautiful or special? If you’re going to invest in upgrading another part of your life, it’s important feel great while doing it. Today, I’m highlighting five brands and standout products that are worthy of your attention as you go through some reinvention! Beauty myth debunked: washing your hair everyday is NOT a good idea. I know some people are obsessed with scrubbing up, but really your scalp needs to replenish itself with the natural oils that are stripped away when you’re under the water. Dry shampoo has recently become my new best friend – it adds instant lift and volume at the roots for second-day locks, meaning you can skip a shower. The trick when using something right at the roots of your hair is to find something organic and all-natural, like skinnyskinny’s unisex range of dry shampoos with lush scents like Rose and Black Pepper or Grapefruit and Cardamom. Incidentally, skinnyskinny is an amazing, expansive line of organic beauty products that comes in really adorable packaging to boot! Try putting together a custom package of products to gift to the back-to-schooler in your life; choosing organic is just as much as a beauty reinvention as anything. For the record, you can also pick up skinnyskinny products at GreenBeauty.ca, FreshFaced.ca, Vedalift.com, and Oresta.ca! BONUS: CGG readers, place your orders – you’ll get 15% off and a bonus sample product from skinnyskinny when you use the promo code ‘CGG15’ at checkout, but only for the next week! I’m fascinated by this next entry because, quite frankly, the fragrance game is crowded. It seems every celeb and fashion designer has a few signature scents to their name by this point – but a full line of makeup? That’s still new territory for a lot of folks. Marc Jacobs has entered the fray with his first-ever makeup collection, including the basics – foundation, concealer, liner, powder – and a palette of products that just happen to be perfect for fall. Rich, jewel-toned eyeshadow palettes, polishes, lipsticks, and glosses are rounded out by a set of artisan brushes. Frankly aside from the intrigue factor for me, I’m also keen on the adorable pill-inspired packaging. It’s just that extra je ne sais quoi, you know? Splurge on a bold yet on-trend colour this fall to help refresh your beauty regime. Available at Sephora. Part of the natural beauty movement is spurred on by a desire to return to ‘simpler times’. By Nieves, one of my new favourites in the category, has capitalized on that with their line of handmade products that are packaged in really adorable, apothecary-style bottles. While their items would probably look more at home on a turn-of-the-century drugstore shelf than your medicine cabinet, they certainly take into account modern beauty concerns. One of my favourites of the bunch is their Wizard of Oz-esque ‘Cloud of Protection’, which uses the natural defensive power of essential oils to work as an anti-microbial shield against the bacteria and viruses that tend to pop up once we’re all trapped in school and office buildings together in the fall. It can be used as an air spray to freshen up after cleaning or even as a safe hand sanitizer before noshing down on lunch. Spritz your kids on the way out the door or gift it to someone that’s entering a new work or school environment this season. If you’re not ready to make a dramatic change this fall, how about just taking advantage of a brand that’s done the legwork for you? Sally Hansen has released two new textured polish lines this fall. The Sugar Coat polishes make it look like you’ve dipped your wet nails in a jar of sugar for a funky, grainy look. Meanwhile their Fuzzy Coat line-up – inspired by the chunky knits that dominated the fall runways – uses micro-bars of matte flakes to give your nails a nubby look that’ll perfectly match those new snuggly cardigans and pullovers you snap up while fall shopping. It’s a low-commitment yet memorable way to upgrade your style profile – plus makes a fun birthday gift for your closest girlfriends. Finally, a Canadian brand! As the lovely Jessica of Stark Skincare noted to me, her brand of 100% natural vegan beauty products are actually probably better known outside of her home and native land. Again, not to oversell the packaging, but the mix of primary colours, clean lines, and glass bottles will make for standout pieces on your bathroom shelves. Of course, they’ll also have a standout effect on your skin. 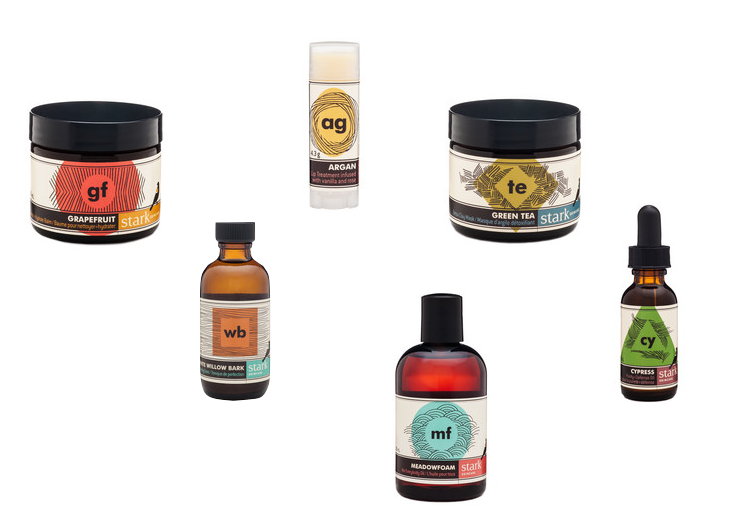 Instead of producing a dozen scent variations per product, the entire line is meant to work and complement one another. A personal favourite is the Green Tea Detox Clay Mask, which comes to you as a dry powder to be mixed with a wet ingredient of your choice – water, tea, and juice are all fair game. It’s particularly timely during the fall season for two reasons. First, it works wonders on dry, flaky skin – either from sun damage or from a cooling off in the temperature (try mixing it with honey for extra nourishing benefits). It also helps to efficiently and gently clear up acne, meaning you can kick those zits to the curb well before school photo day rolls around. 1) Leave a comment by September 16th, filling me in on which of these products / lines you’re most eager to sample and why! 2) Entries are limited to one per person / per email address / per household (or more if you score bonus entries). A random draw will be conducted on or around September 17th to select the winners, who will have 48 hours to respond before another winner is chosen in their place. 4) Bonus Entry: Like Stark, skinnyskinny, Sally Hansen Canada, or Marc Jacobs on Facebook; leave a comment about why you’re keen on trying their product, leave a link back to your comment here, earn up to 4 bonus entries (1 per page you Like). I love the : Choice Product – Cloud of Protection bath salts and body balm. I want to try the dry shampoo! I would like to try skinnyskinny Dry shampoo. I have tried other brands and they make my scalp feel itchy so getting to try this would be my choice. I’m all about preserving my skin so I would like to try the Neives Cloud of Protection line of products. 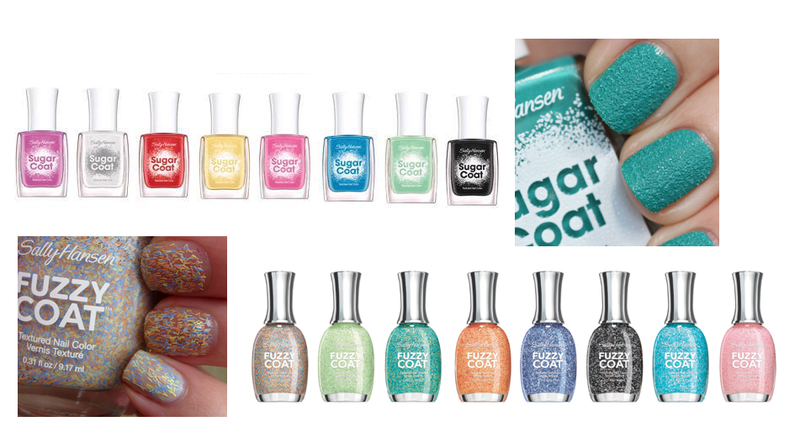 The Sugar Coat & Fuzzy Coat nail polishes caught my eye. I’m due for some new nail polish colours. I really like that stark Skincare line and would love to try the Green Tea Detox Clay Mask as I think it might be good for my adult acne. I’d like to try a product by Nieves. 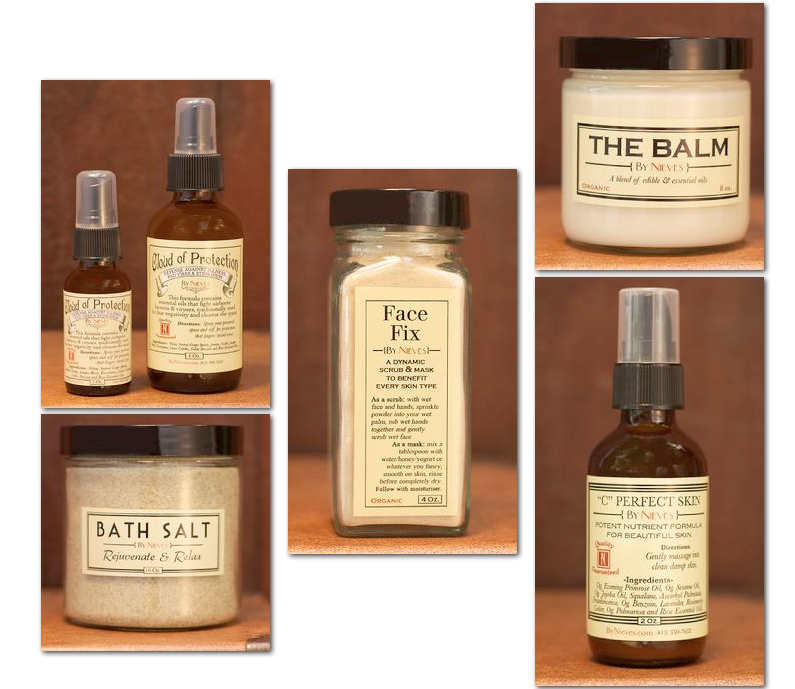 Love the apothecary labels and the natural skin care focus. The Fuzzy Coat nail polishes!! I’m a nail polish addict! I love the natural beauty aspect of Nieves and the packaging is wonderful. 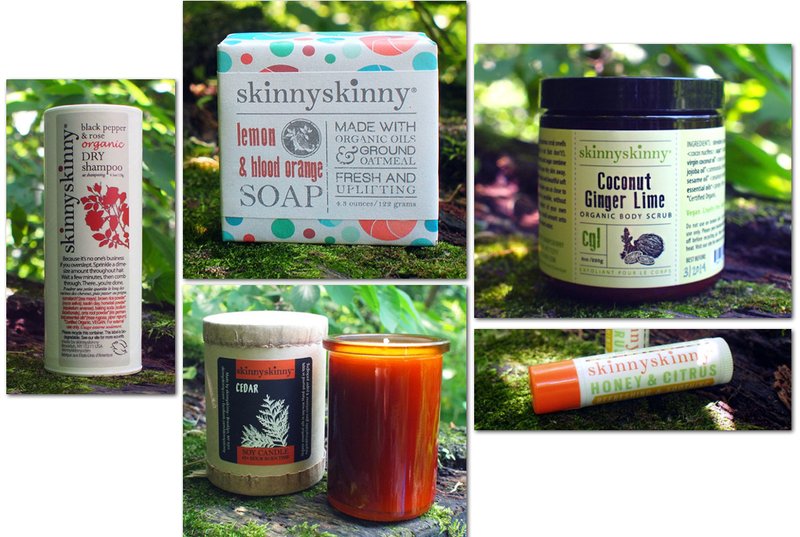 The skinnyskinny line sounds fantastic and the products are so enticingly presented. The Lemon & Blood Orange soap sounds blissful & the Coconut Ginger Lime Body scrub sounds yummy. And I love that’s it all organic! Will order some of these from one of the Canadian sites you’ve listed, I hate getting dinged for the duty charges when ordering from the U.S. (sometimes it ends up costing as much as the products themselves). I am most excited to try the Sally Hansen: Choice Products – Sugar Coat & Fuzzy Coat Nail Polishes,,because I love trying all different nailpolishes,,great! I am totally into the Green Tea Detox Clay Mask, have yet to find a decent clay mask at a decent price. Liked MJ on FB – Melinda Liu. green tea detox clay mask, its hard to find a good clay mask these days and my face sure could use something. I am most eager to sample the Sally Hansen Fuzzy Coat nail polishes. I am a polish addict and think these are so cute, especially the multi-coloured one. the nieves bath salt would be great for me – i take baths a lot and i would definitely use these. 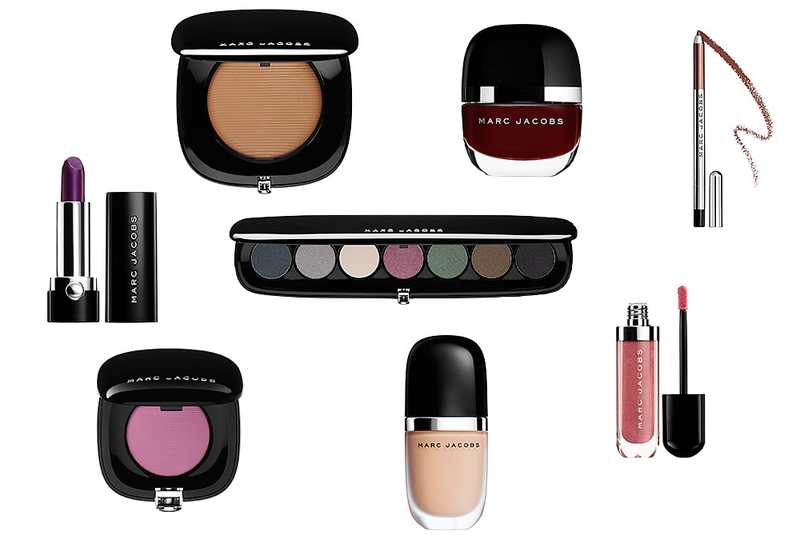 I’d like to try the Marc Jacobs beauty products – it’s nice to have new products to try in the fall! I want to try the dry shampoo! because some days I don’t feel like shampooing/ conditioning ect…..
Nieves products sound excellent for me, anything that is more nature is best. By Nieves – the bath salts. I love them so much especially after a run! I’d like to try the skinny skinny dry shampoo because sometimes I don’t have time to wash my hair. I would love to try the Marc Jacobs makeup collection with the rich fall colours. I’d love to try the skinnyskinny collection. I like that it’s organic and the packaging is beautiful! I would love to try the Green Tea Detox Mask for my dry skin. I would love to try the Stark Skincare Green Tea Detox Mask because I’m try to only use all natural beauty products. I am looking forward to trying out Marc Jacobs makeup line. Since he is in the fashion industry I am thinking his products will be amazing for the coming fall season. I would love the Sally Hanson nail polish. Really adds the final touches. the fuzzy nail polish seems pretty neat. i would like to try it because I don’t really understand how it works and I need to see it in person. I’d love to try the dry shampoo. I’ve been meaning to try one but haven’t seen one that looks appetising enough to buy. I’d like to win the Style Eye-Con Palettes from Marc Jacobs. It would be nice to have a new set of makeup – I don’t often try on eyeshadow in the stores so this would be a nice way of finding new looks. The nail polish because the colors look cool! I would love to try the Nieves products. I love the old apothecary style and the focus on natural ingredients. I would love to try the fuzzy polish by sally Hansen! I love doing my nails! I like skinnyskinny on Facebook! Marc Jacobs Beauty: Choice Product – Style Eye-Con Palettes. I like the colours. I would like to try the Green Tea Detox Clay Mask. I like that it is natural and easy on the skin. The nail polishes are cute but once I read Lemon and Blood Orange soap, I was intrigued. I want to try the skinnyskinny products. I like Stark on FB. Marc Jacobs Beauty would be my pick because I would like to find out how good their line is. Whether it’s a high quality line or not. I would love the Sally Hansen nail polish line, I would give it to my daughter, she has so many cheap nail polishes and it would be nice to through them all away and she can have something good to use. I liked Sally Hansen Canada on FB! I really really want to try Skinny Skinny Dry Shampoo. I use dry shampoo all the time but I have never found an organic product before and I have been looking! I love Marc Jacobs so i would love to try his makeup line. I would like to try the skinny cow lip balm. My lips get chapped in the winter. I would love to try the Nieves line- the packaging is absolutely beautiful! I hope the product is equally beautiful! Marc Jacobs Beauty: Choice Product – Style Eye-Con Palettes for sure ! Nail polish would be great! Color The Tease 202 because I love their makeup. I’m most interested in trying the Nieves Bath Salts; I love me a good soak! I’d like to try the green tea detox mask…it’s the season for detox! Sally Hansen Sugar Coat nail polish. Love the look of this finish. I am really looking forward to the Sally Hansen nail products I just haven’t yet tried the fuzzy coat or sugar coat lines yet but doing my nails is what I do for myself and most enjoy! I’d like to try the green tea detox mask. Looks nice. I would want to try Marc Jacobs lip gloss because it would be great quality. I would love to try the skinnyskinny Blood Orange soap. I LOVE citrus! I can just imagine the smell…..Yum! I’d like to try skinny skinny dry shampoo because I really don’t feel like I have time for a shower every single day, but my hair feels dirty if I don’t wash it every day. This sounds like the perfect solution!